This Nothing but the Facts statement by the Committee on Capital Markets Regulation aims to provide policymakers with relevant facts related to the role of community banks in the United States economy and how access to these financial institutions has changed in recent years. Throughout this statement we rely on the Federal Reserve’s definition of a community bank as a banking organization with total assets of less than $10 billion. 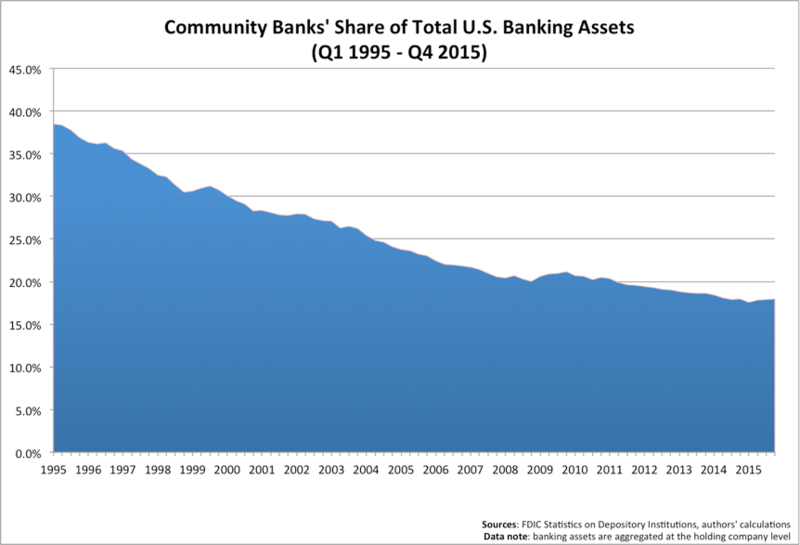 We find that in recent years there has been a significant decline in the share of U.S. banking assets held by community banks and the number of community banks. More specifically, community banks’ share of U.S. banking assets was 30 percent in the early 2000s, 21 percent in 2010 and is now stands at just 18 percent. Similarly, in the early 2000s there were over 8,000 community banks, in 2010 there were 7,000 community banks and there are now just 5,600 community banks in the United States. But, why should this be a concern for the U.S. economy? The facts demonstrate that there are several reasons. First, according to a recent study by the Federal Deposit Insurance Corporation (“FDIC”), community banks are the only source of physical banking offices in one in five U.S. counties and hold the majority of deposits in rural counties. By enabling access to basic bank accounts in rural counties, community banks in turn facilitate access to traditional credit products that are critical to the economic health of American households. Figure 1 further demonstrates the importance of community banks to rural communities, showing that community banks account for 76 percent of bank agricultural loans. Second, the U.S. Government Accountability Office, Federal Reserve, and FDIC all find that community banks’ ability to leverage interpersonal relationships allows them to serve small businesses particularly well. As Federal Reserve Governor Daniel Tarullo noted in 2014, “credit extension to smaller firms is an area in which the relationship-lending model of community banks retains a comparative advantage. It means that community banks are of special significance to local economies.” This is demonstrated by Figure 2, which shows that community banks account for 49 percent of small business loans. 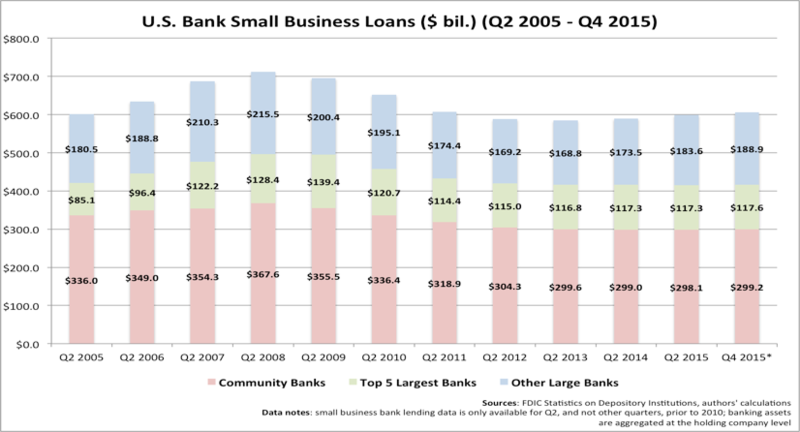 However, Figure 2 also demonstrates that relative to mid-2010, there has been an 11 percent decline in small business lending by community banks. Figure 3 and Figure 4 demonstrate that the significant reduction in the share of total U.S. banking assets held by community banks coincided with the implementation of the Riegle Neal Interstate Banking Act in 1994 and the Dodd-Frank Act in 2010. The Riegle Neal Interstate Banking Act facilitated consolidation of assets among banks because it removed many of the restrictions on opening bank branches across state lines. After consolidation, many banks would be too large to continue to qualify as community banks. Should you have any questions or concerns, please do not hesitate to contact the Committee’s Director, Prof. Hal S. Scott (hscott@law.harvard.edu), or its Executive Director of Research, John Gulliver (jgulliver@capmktsreg.org), at your convenience. A pdf of this release can be found here.